Lock in a great price for Guesthouse Rajska Vrata – rated 9.8 by recent guests! Location perfect, in the middle of the pist, Easy going feeling and all what you need just next door. You have everything you need for a pleasant stay. There is a restaurant available all day so no problem to eat whenever you like. Place, food, view, everything was excellent. The right place for relax and enjoy in mountain air. Friendly and helpful staff, excellent location on the mountain with the most extraordinary views. Food - par excellence: homemade and delicious. We're definitely coming back. Atmosphere is awesome. Great views. You are right in the heart of the Jahorina ski area and still very peaceful. Definitely one of the best places to stay I've ever seen. Everything was perfect,starting from warm staff welcome. Awesome location, incredible mix of taste with domestic food and homemade tea and fruit juices. 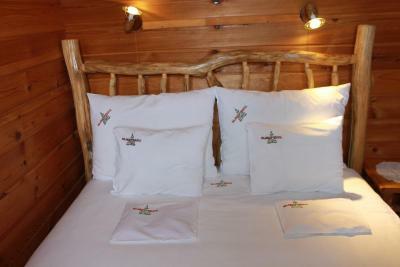 Very comfortable rooms with traditional details, you wish to sleep all day. Strongly recommend to everyone who came to Jahorina. Dobra lokacija smjestaja. Prijatno i ljubazno osoblje sa domacom i ukusmom hranom. Moram da naglasim domaci dzem od malina i sok od ribizle.😊 Topla preporuka i sve pohvale za domacicu! Sve je bilo odlično, počev od osoblja, hrane, lokacije, čistoće.. Prava domaćinska atmosfera! Jedan od najpopularnijih lokala na stazama, gde je uživanje uz hranu i piće, na pauzama izmedju skijanja, zagarantovano!! Povratak u mladost. Netaknuta priroda. Boravak ispunio sva moja očekivanja. Veselim se povratku. Guesthouse Rajska Vrata This rating is a reflection of how the property compares to the industry standard when it comes to price, facilities and services available. It's based on a self-evaluation by the property. Use this rating to help choose your stay! Boasting a superb location on the slopes of Jahorina Mountain and just steps away from the Ski Elevator, Guest house Rajska Vrata offers ski-to-door access and trails that start directly from the property’s terrace. Free ski storage and free Wi-Fi are provided, as well as an on-site restaurant and bar. All accommodations units are traditionally furnished and feature wood-paneled walls and ceilings and wooden furniture. A TV with satellite channels and a private bathroom with free toiletries and a hairdryer is also available in each unit, while some offer a balcony. 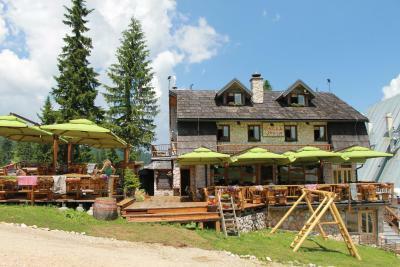 The à-la-carte restaurant serves traditional Bosnian specialties and features a summer and winter terrace and a fireplace. A rich breakfast buffet with homemade products is served each day. Saturday night feature traditional live music. Ski school and hiking excursions can be arranged upon request and for an additional cost. Guests can enjoy the nearby Spa Center that features an indoor pool and massages for a special discounted price. A grocery shop can be found 1,650 feet away. Shuttle transfer can be organized upon request. Train and Bus Station can be found 21 mi away, as well as Sarajevo Airport. Sarajevo City can be reached in 17 mi. This property also has one of the top-rated locations in Jahorina! Guests are happier about it compared to other properties in the area. This property is also rated for the best value in Jahorina! Guests are getting more for their money when compared to other properties in this city. When would you like to stay at Guesthouse Rajska Vrata? Traditionally furnished room featuring wood-paneled walls and ceiling and wooden furniture. It features a TV with satellite channels and a private bathroom with free toiletries and a hairdryer. It offers a view of the mountain. Traditionally furnished room featuring wood-paneled walls and ceilings and wooden furniture. It features a TV with satellite channels and a private bathroom with free toiletries and a hairdryer. Traditionally furnished room featuring wood-paneled walls and ceiling and wooden furniture. It features a TV with satellite channels and a private bathroom with free toiletries and a hairdryer. The studio features a balcony. Traditionally furnished apartment featuring wood-paneled walls and ceilings and wooden furniture. It features a sofa, TV with satellite channels, a fully equipped kitchenette and a private bathroom with free toiletries and a hairdryer. This twin/double room features a flat-screen TV. House Rules Guesthouse Rajska Vrata takes special requests – add in the next step! Guesthouse Rajska Vrata accepts these cards and reserves the right to temporarily hold an amount prior to arrival.